Win A Paw Patrol Birthday Party Or Paw Patrol Toys! Spin Master is sponsoring the Paw Patrol Mission Paw Giveaway at MissionPaw.PawPatrol.com where fans can enter a Paw Code found inside specially marked Paw Patrol packages for a chance to win a Paw Patrol birthday party or Paw Patrol toys. Consumers can purchase one of 1,185,977 specially-marked packages of participating Paw Patrol toys now through May 31, 2017 and look for a code printed inside. 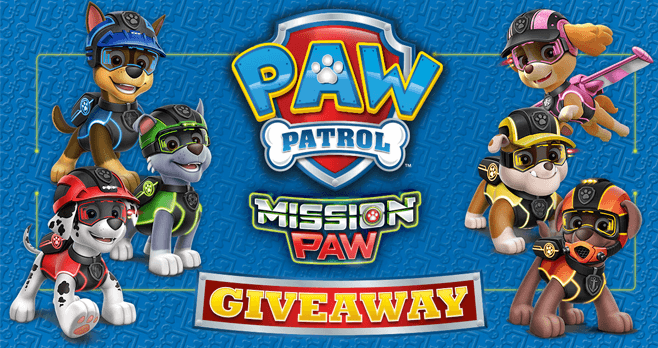 Once they obtained a code, they can access the entry form at missionpaw.pawpatrol.com and register for the Promotion. Participants must enter their code to find out if they are instant winners. They will also automatically be entered into the Sweepstakes for a chance to win the grand prize. Eligibility: The Paw Patrol Mission Paw Giveaway is open to legal residents of the 50 United States, Washington D.C. and Canada (excluding Quebec) who has reached the legal age of majority in your state/province/territory of residence. Sweepstakes Period: Begins at 9:00:00 AM on March 1, 2017 and ends at 11:59:59 PM CT on May 31, 2017. Limit: Limit of 50 Instant Win game plays and 50 Sweepstakes entries per person, per email address during the Promotion Period, regardless of method of entry. Random Drawing: On June 13, 2017 at approximately 2:00 PM CT, an independent judging organization will randomly draw one entry for the Sweepstakes Grand Prize from among all eligible Sweepstakes entries. Sponsor: Spin Master Inc., 5880 W, Jefferson Blvd, Suite A, Los Angeles, California 90016. I just bought one of the toys yesterday 1/5/18 and found a sweepstake code and thought it was perfect my sons birthday is February 24th and he absolutely loves paw patrol! He will be turning 3. But it turns out this package was 10 months old.. really bummed for him.